Knuffi® Trailer Lock Power Lever makes short work of stubborn container door handles that are difficult to move because of their small size and are often jammed, especially in snow and ice conditions. Just slip the tool over the door locking handles and easily use the extra leverage provided by the Trailer Lock Power Lever to open the doors. The extra leverage reduces operator strain and can help prevent injury. 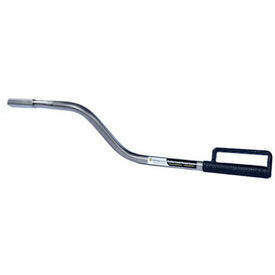 The Trailer Lock Power Lever can also be used as a "Tire Thumper" to check for adequate tire pressure.